Minute to Win it was such a fun television show to watch. A lot of people like to set up their own challenges at home, based on the television show. 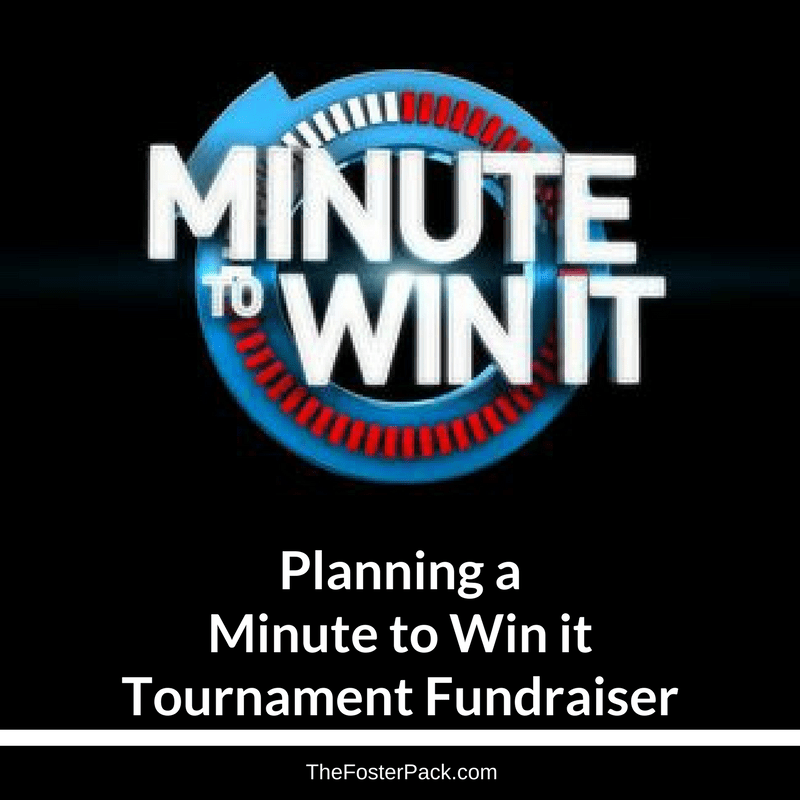 So why not turn it into a Minute to Win It Tournament Fundraiser? Contestants are given sixty seconds to complete a game or challenge using everyday objects. Quick games that often look very easy to complete in 60 seconds, but a lot of them are harder than they look from the sidelines. Select your venue and date. This would be an event that would probably be best to hold indoors. Wind, rain, uneven ground would make setting up your events much harder. It would also affect gameplay. So a big banquet hall, gymnasium, or fire hall would be a great venue. Choose your events, and pick up the necessary supplies for them. Tables will most likely be needed for a lot of the events. See below for ideas for your challenges. You’ll also need stopwatches, but most smartphones have them now. Arrange for volunteers to run registration and each challenge, along with volunteers to run any additional fundraising stands that you will have going on that day. Such as Chinese auctions, bake sales, food stands, 50/50 drawings, etc. Advertise for participants, charge a fee, $25+ for each team of 2-3 to enter the tournament. Possibly give a small discount for pre-registration. If helps give you a better idea of how many to plan for. But also allow for registrations the day of the event. Solicit prize donations from local businesses and organizations. You could also do a cash prize, using some of the registration fees. Make up your tournament brackets. And have fun on the day of the event! Emptying a tissue box with one hand. Getting a cookie from your forehead to your mouth without using your hands. Stack twenty-five pennies, using only one hand. Long snapping toilet paper through a [amazon_textlink asin=’B00CQ2268O’ text=’Hula Hoop’ template=’ProductLink’ store=’fosterpack-20′ marketplace=’US’ link_id=’ee0664c5-3c0c-11e7-a47c-b92c5c8b6934′]. Transfer 25 M&Ms from one place to another, using a straw and your mouth. Picking up cotton balls with a [amazon_textlink asin=’B000EOJ8BE’ text=’Vaseline’ template=’ProductLink’ store=’fosterpack-20′ marketplace=’US’ link_id=’f9ca061e-3c0c-11e7-a091-abfceabd7a77′]-coated nose. Pyramid stacking 36 [amazon_textlink asin=’B071H84S86′ text=’plastic cups’ template=’ProductLink’ store=’fosterpack-20′ marketplace=’US’ link_id=’09b97637-3c0d-11e7-8a78-879da784a26b’] then tearing them back down into one stack, with only one hand. Bouncing [amazon_textlink asin=’B00J39OM2Q’ text=’ping pong balls’ template=’ProductLink’ store=’fosterpack-20′ marketplace=’US’ link_id=’128e5a88-3c0d-11e7-ab46-e3e530babe05′] into a bucket on a team members head. Transferring six [amazon_textlink asin=’B010L610EC’ text=’ping pong balls’ template=’ProductLink’ store=’fosterpack-20′ marketplace=’US’ link_id=’1e05d761-3c0d-11e7-bfda-15666ce16947′] with a [amazon_textlink asin=’B001UBLV1K’ text=’plastic spoon’ template=’ProductLink’ store=’fosterpack-20′ marketplace=’US’ link_id=’2cb1f18d-3c0d-11e7-9bc2-676feca325a7′] in your mouth from one container to another. Threading five [amazon_textlink asin=’B0143GL55A’ text=’hex nuts’ template=’ProductLink’ store=’fosterpack-20′ marketplace=’US’ link_id=’36a258bb-3c0d-11e7-bf22-6d4eb42328c0′] onto a [amazon_textlink asin=’B000EO0XV8′ text=’wooden skewer’ template=’ProductLink’ store=’fosterpack-20′ marketplace=’US’ link_id=’3f9aa435-3c0d-11e7-b295-b722e3edb40e’], then stacking them, using only one hand. Keep two [amazon_textlink asin=’B00J6EFS5S’ text=’balloons’ template=’ProductLink’ store=’fosterpack-20′ marketplace=’US’ link_id=’4b4eb4db-3c0d-11e7-8700-95a48855f596′] in the air for a full minute. Bouncing a ping pong ball off of the floor and getting it to stick to a piece of bread coated with Vaseline. Throwing quarters into a [amazon_textlink asin=’B003B27RAA’ text=’water cooler jug’ template=’ProductLink’ store=’fosterpack-20′ marketplace=’US’ link_id=’5edd6bbb-3c0d-11e7-accf-833d17124f16′], by bouncing them on the floor. Stacking six cupcakes on your head. Blowing plastic cups over with a balloon. This list should get you started, but see what other creative games you can come up with using household items and a minute of time, for your Minute to Win it Tournament Fundraiser.